By default if you search something in windows computer, it searches matching your query against the file names. It never cares to look what is written inside the file. As in this way the indexes which windows system have to store is of least size, Microsoft has kept this searching option as default. But, what if you do not remember the name of the file, but remember something from inside file’s text. If you want to search required file by text inside file, you have to do a simple tweak in indexing options. Please follow described steps given below to customize Windows 10 to search inside files for text. 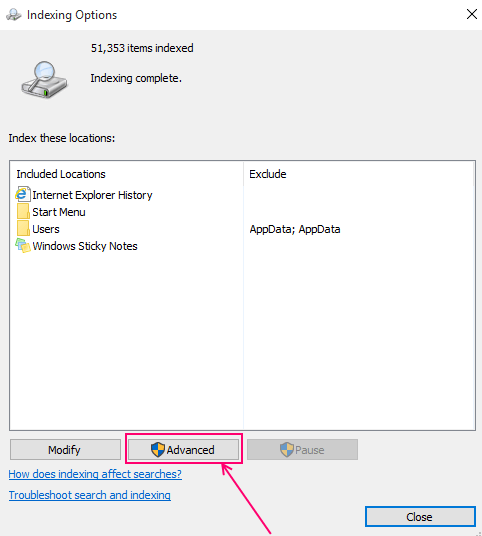 Step 1 – Search indexing options in the search box of taskbar. Click on Indexing Options which appears as a search result. 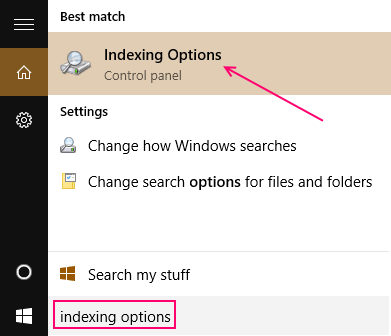 Step 2 – In indexing options window, click on Advanced as shown below. Step 3 – Now in the advanced options window, select file types tab. 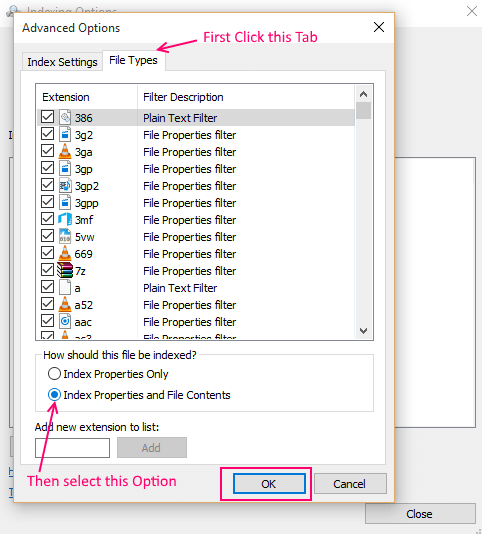 Then , select index properties and file contents below how should this file be indexed? as shown in screenshot given below. Once you click ok, a message saying rebuild has started will be shown to you. Confirm this and the rebuiilding the index process will start running in the background. It may take several hours to few days depending upon the size of the files on your PC. You can shutdown or reboot and the process will start from where it left. You can search normally and can perform all the windows PC functions normally without any trouble. The windows search will function based on the last rebuild, that means the last settings in indexing options. Once this rebuild process gets completed, your searches will automatically be based on new settings. That means you will be able to search inside files for chunks of texts or words.